Is your garden ready for its close-up? The Philips Hue Lily—a companion product to the Hue Calla pathway light we reviewed in December—consists of three color-changing smart LED spotlights that you can mount on stakes or attach to walls. Deploy them in your garden and they’ll provide sophisticated lighting accents for your landscaping. But if your trees and shrubs look subpar in the daylight, the Hue Lily will really make them look shabby at night. The lights themselves, as you would expect from the $280 price tag (add-on spots cost $80 each), are first-rate luminaires. The cylindrical enclosures are fabricated from black aluminum with glass lenses, and their IP65 rating indicates that they are entirely weatherproof: Protected from water jets (from up to a 6.3mm nozzle, such as a sprinkler system), and totally protected from dust. Wiring the Philips Hue Lily spotlights is as easy as screwing two barrel connectors together. 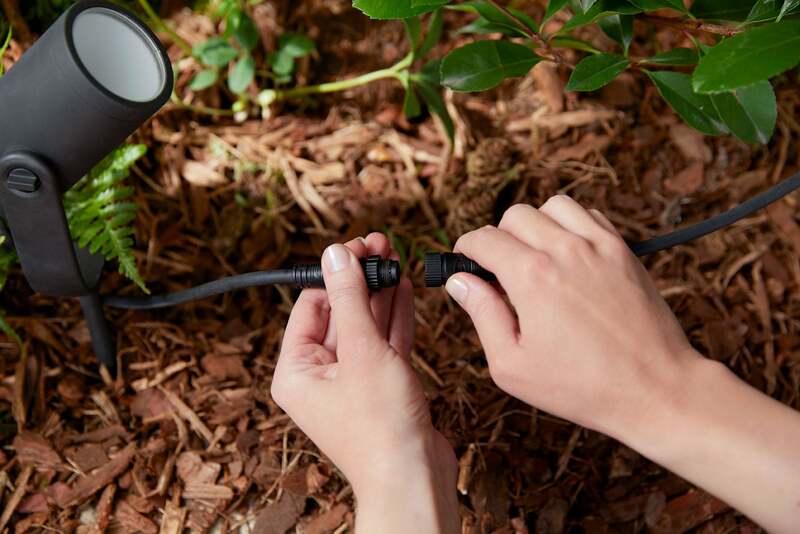 You’ll need to plug a sealed inline power supply into an outdoor outlet, and then connect a second cable to that using a bayonet-style fitting. Philips provides two T-shaped electrical connectors that give you lots of cable-routing flexibility. You can buy extension cables if you want longer runs between each light, or if your outdoor outlet is far from where you want to deploy the lights. The color and brightness of each spotlight can be programmed independently. The dimmable LEDs inside produce up to 600 lumens (equivalent to a 49-watt incandescent bulb), and each one can be controlled independently using the Hue app. 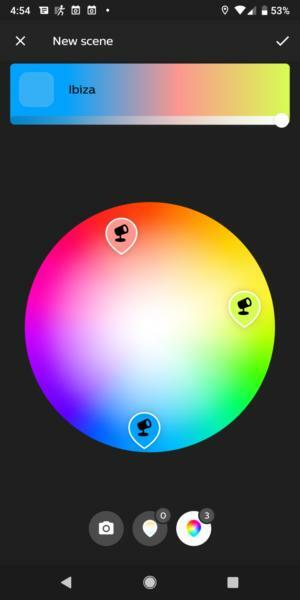 That independence goes beyond being able to turn them on and off, too; you can set each light to produce either white light (in color temperatures ranging from a warm 2,000 Kelvin to a very cool 6,500K), or any of 16 million colors using the respective color wheels in the app. In addition to that, you can call up predefined lighting scenes, based on color and brightness, or you can edit these and create your own from scratch. As with all Philips Hue products, this one is based on ZigBee wireless technology, so you’ll need to connect a Hue Bridge to your router if you don’t already have one (the bridge, which is not included, sells for about $50 on Amazon). Each bridge can support up to 50 Hue lights. Hue Routines, meanwhile, allow you to create sequences of lighting events based on the day of the week and the time of day. I created a routine I called “Backyard at night,” for example, that turns the Philips Hue Calla bollard-style pathway light to a scene called “bright” to light up my walkway, and the three Philips Hue Lily spotlights to a scene called “Savannah sunset” to bathe a Japanese maple and a couple of large shrubs in a warm white light. This routine comes on automatically at sunset and turns off and sunrise. If you have a smart speaker, you can control any of the Hue lights with Alexa or Google Assistant voice commands. To conserve energy, I typically tell Alexa to turn off the Hue lights when I go to bed. But it’s nice not having to remember to turn on any lights when I go outside at night. Installing one of the new Hue Outdoor sensors would be an even better solution if you want illumination only while you’re outside (or if you want movement to trigger lights to come on to dissuade burglars from hanging around). That sensor can also trigger Hue lights inside your home to turn on in response to motion outside of it. Signify (formerly Philips Lighting) expects its Philips Hue lighting products to fetch a pretty penny; so far, they have consistently delivered the type of high-quality product and premium experience that justifies the price tag. The Philips Hue Lily is no exception. 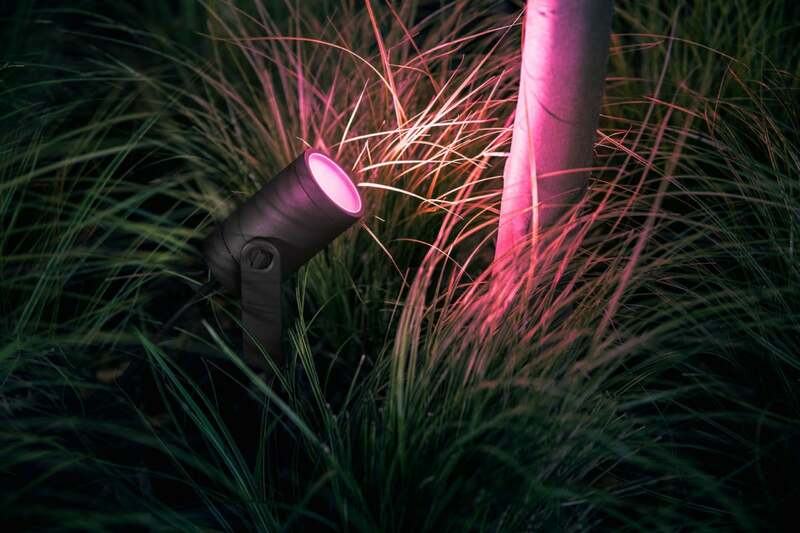 This story, "Philips Hue Lily outdoor spotlight review: The perfect highlight for your outdoor landscaping " was originally published by TechHive.